Joel Embiid was limping in the opening minutes against the Nets (Image: GETTY)Embiid's knee injury has been shrouded in secrecy in recent months, with Philadelphia keeping quiet on the issue.He has been battling with the trouble since the All-Star break, with the 76ers choosing to limit his minutes.The 25-year-old was a game-time decision for Game 1 and put up an impressive 22 points in just 24 minutes along with 15 rebounds. But it wasn't enough to help the 76ers take a 1-0 lead as Brooklyn took the opening game. Related articles Zion Williamson officially declares for 2019 NBA Draft Joel Embiid injury: Sports doc gives DEVASTATING update on 76ers star Embiid was once again a last minute decision to start the all-important Game 2 at the Wells Fargo Center. But Brett Brown decided again to put Embiid in to start and he was given a huge cheer from the home crowd when his name was read out among the starters.However, the 76ers head coach would have looked on with bated breath in just the opening exchanges when Embiid jumped for a loose ball.Joel Embiid has been battling a little bit of tendonitis (Image: GETTY) Related articles NBA trade news: LeBron James and Anthony Davis backed to join Celtics NBA news: Warriors GM Bob Myers LAUGHS off Lakers rumours Joel Embiid played restricted minutes in Game 1 of 76ers vs Nets (Image: GETTY)He reached out of bounds to keep the ball in play, but ended up bumping into a chair on his left knee. 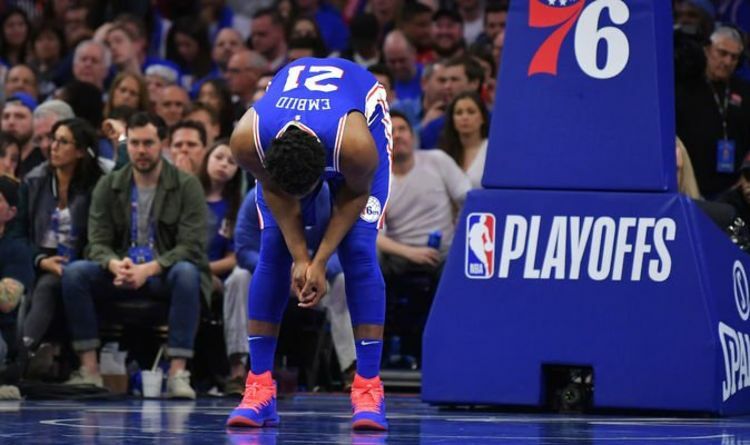 And he gingerly moved back down the court, clearly limping on his left leg.Embiid briefly looked over to the bench as he rolled back down the court, but was swiftly back in the thick of the action and running without any issue again.It remains to be seen whether Brown will choose to play Embiid on restricted minutes again like he did in Game 1.